Are you a pumpkin spice person or not? I’m told you either do or don’t, no in between. NOT something you have to worry about with Laurie’s Scraps PUMPKIN PATCH collection [https://bit.ly/2qP0w7O]. You are going to love this. Right in the midst of autumn splendor time of year, the collection is full of fall quotes on cards, word bits and titles and lovely flairs with autumn and pumpkin themes. There are also flowers, leaves and grunge in a stunning gold, orange, brown and teal palette. 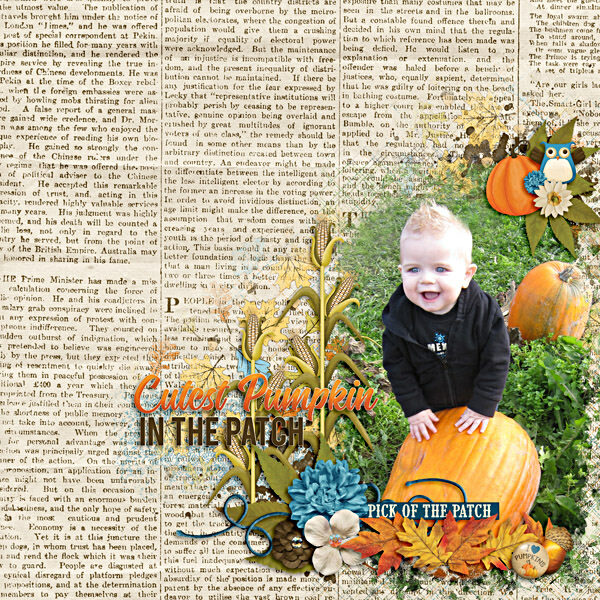 The solid and patterned papers will work with any fall layout but would also be perfect to highlight a trip to the corn maze, apple orchard or……….. Wait for it, PUMPKIN PATCH [https://bit.ly/2qP0w7O]! Get it today! The collection is awesome! Love the color combination and the cute owls. Loved working with this kit!